What is happening in the cornea of this Cavalier King Charles Spaniel? 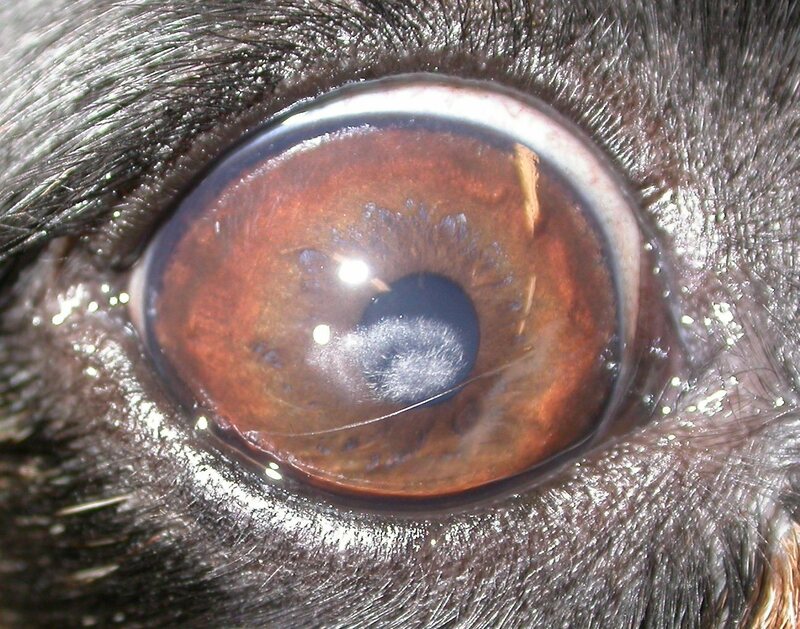 This dog has a crystalline stromal lipid dystrophy – an inherited defect in how the keratocytes – the corneal cells – deal with lipid, leading to a deposition of lipid crystals in the centre of the cornea. It looks identical to Schnyder’s dystrophy in people as shown below, but whether the same gene mutation is present is currently unknown. In people this makes reading and driving at night difficult, but in the dog the lesion doesn’t interfere with vision (as they rarely read or drive at night!) and the lipid deposit is unlikely to develop markedly. One Response to A cloudy view? I think there is corneal dystrophy or corneal lipidosis on central cornea, oval form opacity. Actually , My little girl, Mong sun(Korean Mixed dog) also is suffering from same corneal condition. but, Serum chemistry results are within normal range(cholesterol, Triglyceride etc) . So, I’m wondering about supportive care, effective drug, food control..?